The Hellenic Centre is a vibrant cultural organisation founded as a charity in 1994. There were many attempts to establish such a centre before but the breakthrough arrived in 1992 with a combination of Trustees, fund-raising and our now permanent venue. We are located in a beautiful early 20th century Portland stone and red brick building in the charming and sought-after area just off Marylebone High Street in central London. This was purchased with the help of generous donations and support from many individuals and organisations. See list of donors, amongst them the A G Leventis Foundation, Fafalios Shipping SA, the Bank of Cyprus London Ltd, the Michael Marks Foundation, and the Governments of Greece and Cyprus. The Hellenic Community Trust was established as a charitable body to take ownership of the building, and an appeal was then launched to raise further money needed for the renovations and refurbishment that were required to provide a number of meeting and exhibition rooms, the most impressive of which is the Great Hall. The Centre was blessed by His All Holiness the Ecumenical Patriarch Bartholomew I in 1993, and officially inaugurated on November 18th 1994 by His Excellency the President of the Republic of Cyprus, Mr Glafcos Clerides. 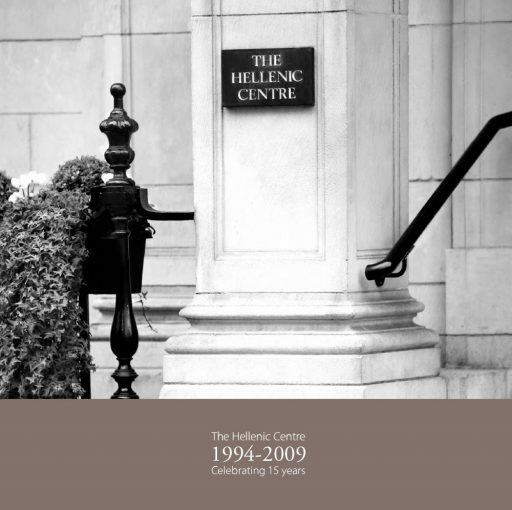 In 2009, we celebrated the 15th Anniversary of the Hellenic Centre, and published an elegant brochure to mark the occasion.